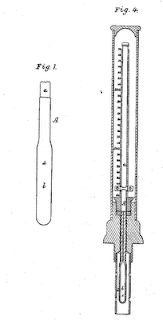 and on the right from 1874 for rock candy with the thermometer [B] sticking out to read the scale. 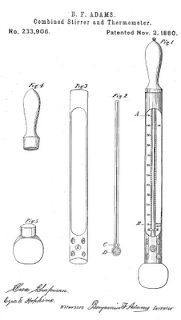 An interesting line of patents involved combining thermometers and stirrers as in the following two examples from 1880 and 1904. 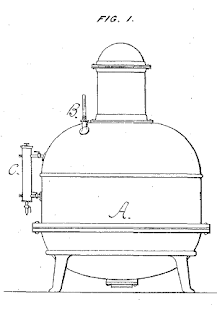 In the first, BF Adams stated that..."In the manufacture of confectionery... it is necessary for the attendant to stir the liquid continually to prevent it from burning, and also to observe the temperature of the same. 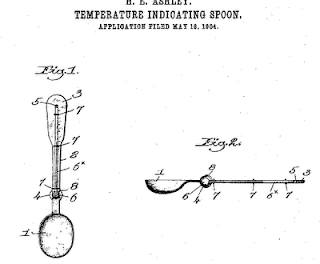 It was heretofore been customary to use one hand for holding the stirring spoon or spatual, and the other hand for holding a Fahrenheit thermometer in the liquid." "Of all the tools for making candy, the candy thermometer is the most important. 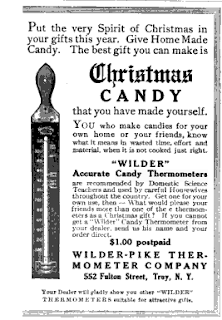 ... Candy thermometers cost from one to three dollars, and can usually be purchased at any good candy supply house or at a good hardware store. If it is not possible to secure a good the rmometer in your city, one can be secured from The Health Publishing Company, Main and Fourth Streets, Dayton, Ohio. Before using the thermometer the first time, test it in boiling water. The mercury should stand at exactly 212° when the water boils, unless the altitude is several thousand feet above sea level, which makes the boiling point lower. Always use a kettle proportionate in size to the amount of sugar being boiled. The syrup must be deep enough in the kettle to cover the bulb of the thermometer; otherwise it will not register correctly. It will not break the thermometer to place it in the syrup just after it begins to boil, unless it has been in a cold room. When making candy it pays to watch it closely, to read your thermometer correctly, and to remove the syrup from the fire the moment the thermometer registers the correct degree."